As Russia plays host this week to a critical summit of leaders of the emerging market nations of Brazil, Russia, India, China and South Africa (BRICS), Russian President Vladimir Putin is especially keen on bolstering ties with the leading economic power of the group – China. And he likely won’t have much opposition from the Russian people, who now see China more favorably than at any point since 2002. Our recent survey on the global balance of power between the U.S. and China included a number of questions about the world’s two most powerful countries, including a basic measure of favorability – whether Russians have a favorable or unfavorable view of China and the U.S. And on this simple question, the trend is clear: China is gaining popularity in Russia as attitudes toward the U.S. turn sharply negative. In just the past two years, favorable views of China have jumped 17 percentage points among Russians, from 62% in 2013 to an all-time high of 79% today. Meanwhile, favorable views of the U.S. have taken a nosedive, falling from 51% in 2013, to 23% in 2014, to an all-time low of 15% today. Another measure of attitudes between nations is whether or not people believe a country respects the personal freedoms of its citizens. By that measure also, China is rising in the eyes of Russians, while the U.S. is falling. In 2008, 66% of Russians said the U.S. respected the personal freedoms of its people, but that number has fallen to only 41% today. In contrast, the share of Russians who say China respects the personal freedoms of its people has risen to 52% in 2015 from 39% in 2008. Russian confidence in U.S. President Barack Obama has also collapsed in the past few years. Just 11% now say they have a lot or some confidence in Obama’s ability to handle international affairs, while 86% have little or no confidence. But Obama is not alone in falling out of Russian favor. Russian confidence in German Chancellor Angela Merkel and favorable views toward NATO, the EU and Germany all hit new lows in 2015. Meanwhile, our 2014 poll found 44% of Russians had confidence in Chinese President Xi Jinping, while 34% had no confidence and 22% had no opinion. 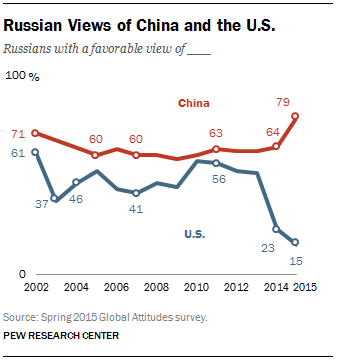 Russians clearly favor China over the U.S. on other measures, too. By a margin of 37% to 24%, Russians say that China, not the U.S., is the world’s leading economy. And 44% of Russians say that China either already has replaced or will replace the U.S. as the world’s leading superpower, while just 35% say this will never happen.